Sterling Silver necklace with 18" sterling chain. You choose if you want the Anchor or the Ships Wheel. Both are pictured in the photo but you only get the one you choose unless you order both. 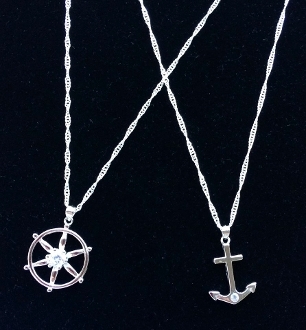 The Anchor and the ships wheel both have a jewel in them. and the anchor and ships wheel are 7/8" tall. This piece is beautiful. The pictures do not do the jewelry items justice. This item has FREE Shipping!